Remember Winnie-the Pooh? That bear who was a result of the wonderful tales A.A.Milne spun for his son Christopher Robin around his toy bear? Which parent has not told a bedtime story of their own making to a child who wanted to be told a story with elements and characters familiar to it? We all do it as parents sometimes. These stories may be loved by the child long after outgrowing them. Freda Bedi, the writer of the book Rhymes for Ranga, did something similar. She was a British woman married to an Indian. When her first son Ranga was a baby, she realised that she did not know any rhymes for him which incorporated the surroundings familiar to him, activities and festivals. So she simply set about writing her own for him. This was in the pre-independence era- around the 1930s-40s, and these remained as a collection within the family. They were recently published by her second son, the actor Kabir Bedi, and here they are for everyone to enjoy. A mother's labour of love. This is what she has to say in a letter to her son, which is published at the end of the book. "These rhymes grew up with you, Ranga, and they grew out of you, because it was sometimes the little words you said, and the nonsense songs you sang, that quickened something in me and gave them birth." 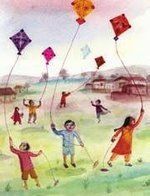 The rhymes are very simple, and speak of the family, the land, the familiar birds, animals and trees around, and common festivals like Diwali and Eid. They show how completely she had made this country and its people her own. She had joined in the freedom movement against the British, a fact that is reflected in her rhymes about Gandhiji, freedom and the tricolour. Towards the end of her life, she had embraced Buddhism and renounced everything to become a nun, and these leanings too are seen in some rhymes. The dated feel of the rhymes adds to their appeal, for the India of the 1940s that they depict is very different from the India of today, yet very familiar- not very far from how rural India is even today. The book is beautifully illustrated by Anna Bhushan, a multiple award winning UK based illustrator of Indian lineage. Very charming watercolours, in full colour, sometimes full page. Here is one of the rhymes that will give a foretaste of the book. One is a peasant, working with the plough. Two is the milkman, milking a cow. Three is a shopkeeper, selling his eggs. Four is a gentleman, crossing his legs. Five is a driver, his hands on the wheel. Six is a housewife, cooking a meal. Seven is a teacher, stern and tall. Eight is a merchant, fat as a ball. Nine is a dhobi, with a bundle on his head. Ten is a thin man, with his wife well fed. Can you imagine the figures? Very interesting Sandhya ! Would love to check this out. S, remember we'd seen this book together at my uncle's bookshop one time?! Well I was there today as well, and saw it again and now I come home and see your review. Lovely book it is.